I daydream about taking a break from my life and living for a summer in Bar Harbor, Maine. 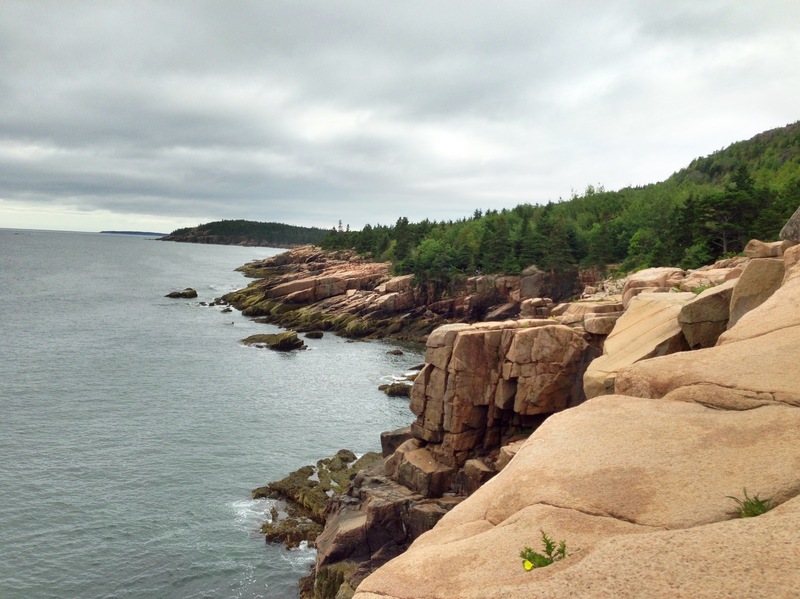 This summer I went on vacation to Acadia National Park on Mount Desert Island. It was one of the best decisions for a vacation that I’ve ever made, and I can’t wait to go back. I traveled by myself and camped out in the park’s campground. Several people gave me confused or shocked looks after they asked, “who are you going with?” But it was amazing to go my myself. I went to Acadia seeking the beauty and peace that only national parks can bring. My first day there, I rode my bike along the carriage roads built by John D. Rockefeller Jr. many years ago. There was beauty around every corner, Rockefeller made sure of that. The road wound back and froth between trees and opening up onto the best vantage points for each vista, lake or mountain. Though it was raining, I set out the next morning on a hike through part of the island with a national park ranger. From watching the National Parks documentary*, I had heard about rangers who were deeply devoted to the parks, with almost endless, secret knowledge of each place. It was true. At each point, the ranger pointed out not only an interesting fact about a rock or plant, but also the history of the place. She told us of the families that once owned the area and answered any question we threw at her with great passion. As a few of us stuck around to ask her more questions, it was clear that this was not just a job. She loved this place with all her heart. ye, you know how wondrous and mesmerizing the stars can be. A park ranger pointed out several constellations, and we saw a couple shooting stars. Usually in New York City, I can see 3-4 stars if I really try hard. In fact, the ranger described the experience as something that the parks are striving to preserve along with the landscape and wildlife. In our modern cities with all of their artificial lights, there are few places where we are able to truly gaze at the stars like humans have for thousands of years. No wonder the ancients were completely captivated by the stars. They make you feel quite small. One of my favorite memories came the last afternoon in Acadia. The island is encircled in walls of granite that jut out into the ocean. At one bend of the island, I climbed out up to where the rocks drop off a few hundred feet to the ocean below. Sitting on the edge, you can hear the ocean waves, the occasional seagull, and the bell of a green buoy. Just off the coast are a small number of large rocks clustered together that can be mistaken for a group of fish or other sea creature (hence the buoy). It was late afternoon when I was there. I sat down near the edge, closed my eyes and listened to the buoy chime out it’s steady warning. It was one of the most peaceful places I have ever been. After a few minutes, a large family with 6 kids arrived and disturbed my place of peace. But thankfully I had received what I needed from the spot. My experience at Acadia was markedly different from my first National Park, Smokey Mountain National Park in Tennessee and North Carolina. The Smokey mountains are absolutely fully of peaceful, beautiful places, but the surrounding area is most different. Entering and exiting the park is a shocking experience. Driving along the North Carolina highway dotted with houses, street signs, light traffic and power lines, you’re met with the entrance to the park. Once you enter, you are surrounded by nothing but trees. No signs, houses, power lines or cell service. As you exit the park into Gatlinburg, Tennessee, the change is even more dramatic. The wildness road of nothing but trees in the park is juxtaposed with blatant tourist attractions from Ripley’s Believe It Or Not to mini golf to whatever chain restaurant you desire just outside the park. It breaks my heart how often we choose the fickle things of life while transcendent peace is literally next door (there’s a sermon in there somewhere). Anyone who has traveled to a National Park in the United States has certainly had a similar experience of finding peace in the parks. But Acadia is a unique national park, as it was mostly donated by wealthy landowners in the early to mid-twentieth century. So, there isn’t a point like in other parks where you enter “the park” and are cut off from civilization. Most of the interior of Mount Desert Island is national park, but the coast it is surrounded by a small harbor towns where people have lived for hundreds of years. My favorite, Bar harbor, is on the east side of the harbor. It has a number of small restaurants and shops focused on outdoor activities. There are no chain restaurants or obnoxious tourist attractions. It’s a small town that is vitally connected to the park but hasn’t been corrupted by tourism. When Rockefeller Jr. built the carriage roads I biked, the locals feared that Acadia would become like Coney Island (Gatlinburg, Tennessee). Thankfully it did not. Back in New York City, I often find myself daydreaming about spending a few months by myself at mount desert island, living in Bar Harbor. There are so few places to find peace in New York City. It’s the peace, the transcendent beauty of Acadia that calls my heart back. I can’t wait to go back. *The National Parks: America’s Best Idea by Ken Burns. It’s on Netflix. Go watch it. **Usually my posts are about church stuff. But John Muir often talked of the national parks as the most beautiful of cathedrals, so I think it fits. There’s also something to be said about the role of God in creating these transcendent places.